The Sounder Sleep System is based on the discovery that certain small, slow, repeated physical movements can shift us from the active, waking state to a state of profound physical and mental repose. When we reach that tranquil state, if we need sleep, we will fall asleep. The Sounder Sleep System exploits the two fundamental, opposing principles of the human nervous system, excitation and inhibition, to produce its sleep-inducing effects. Of the two principles, inhibition is an all-important factor when it comes to sleep. Falling asleep is a process in which the overall balance of excitation and inhibition in the brain (so-called "cortical excitability") is strongly shifted in favor of inhibition. As a result, cerebral processing slows down to a fraction of waking levels, cognitive activity is much reduced, metabolic activity slows, and the entire body becomes still. This is the natural process by which we fall asleep. The core principle of the Sounder Sleep System is that we can use small, slow, gentle bodily movements to initiate and amplify this inhibitory process, at will. The result is natural, restful sleep whenever we need it. The Sounder Sleep System teaches you to exploit the inhibitory power of small, slow, gentle movements. So you'll sleep better, feel better, and enjoy life more. The Sounder Sleep System is based on a lifetime of study, experience, and observation by the system's founder, Michael Krugman. While original in its conception and implementation, it is inspired and informed by contemporary neuroscience and sleep research and utilizes time-tested principles common to all self-healing systems, both ancient and modern, including yoga, qigong, several meditation modalities, and the teachings of Dr. Moshe Feldenkrais. The system has been proven effective by thousands of clients in clinics, schools, and hospitals worldwide. There are currently over 200 teachers of the system in twelve countries. In practice, the Sounder Sleep System employs a two-pronged approach. By day, unique self-healing techniques called DayTamers™ effectively combat stress, tension, and anxiety to make life more peaceful. When your life is more peaceful, your sleep is more peaceful. By night, tiny, sleep-inducing movements that you do right in your own bed, called NightTamers™, hasten the onset of slumber and ensure quick recovery from unwanted awakenings during the night. The daytime and nighttime techniques work together to reduce the stress of life and ensure you get all the natural, restful sleep you need. The movements are so gentle, even your partner won’t know you’re doing them. You will enjoy making these easy, pleasurable exercises part of your daily and nightly life. You can learn the Sounder Sleep System by attending classes, seminars, or private consultations conducted by a specially-trained teacher in your area. For those who can't meet with a Sounder Sleep teacher in person, we offer books, audio, and video via our Shop. "One night I slept so well after doing [a Mini-Move] that I was suprised to wake up to the light of day. I'm so used to waking up in the middle of the night. It shocked me for a moment. I wondered what that light was!"—F. C.
“Thank you again for the excellent experience during and after the Sominar. I have had nights were I slept seven to eight hours. I can't remember the last time I slept that long. Maybe 10 years ago! You are really a great teacher and an admirable discoverer.”—J. R. M.
Michael Krugman founded the Sounder Sleep System in 1999. He was a life-long student of modern and traditional methods of self-healing with over twenty years experience as a teacher and trainer in related disciplines. He was highly regarded for the warmth, clarity, humor, and broad appeal of his presentations. Michael taught and lectured on sleep, alertness, relaxation, and corporate wellness issues all over the US and in Europe. He has taught employees at Saatchi & Saatchi, HBO, and Equitable insurance; nurses and patients at Cedars-Sinai and Torrance Memorial hospitals in Los Angeles; and patrol officers for the NYPD. He has presented the Sounder Sleep System at the New York Open Center, the Kripalu Center for Yoga and Health, Feldenkrais Resources, and numerous other institutions. He has provided curriculum, training, and staffing for corporate sponsored "sleep competence centers" in 22 cities in Germany and Switzerland. Michael has been featured in Fortune magazine, Brigitte (Germany), Elle (France), La Repubblica (Italy), New York Spirit, the Village Voice, Yoga Chicago, Sport Life (Spain), and other publications. 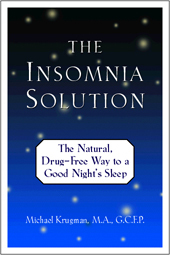 He is the author of The Insomnia Solution, originally published by Warner Books in 2005. Michael Krugman passed away in December 2016 and is terribly missed by the teachers he trained and the people whom he met. This is where it all started! This charming, 24-page illustrated booklet has shown thousands of people all over the world how to achieve a more peaceful life with the pleasurable, easy-to-learn techniques for deep repose. Now in its second edition. This ground-breaking book presents all the basic principles and practices of the Sounder Sleep System in a popular, engaging style. Fully illustrated. Grand Central Books. Paperback, 335 pp. $19.95 plus s/h.